Probably one of the best parts about this Yankee Hollow cheese box is, while it's all cheesy, each cheese ended up being unexpectedly unique and crazy delicious. Especially when accompanied by Yankee Hollow's suggestions, all spelled out on handy little cards. 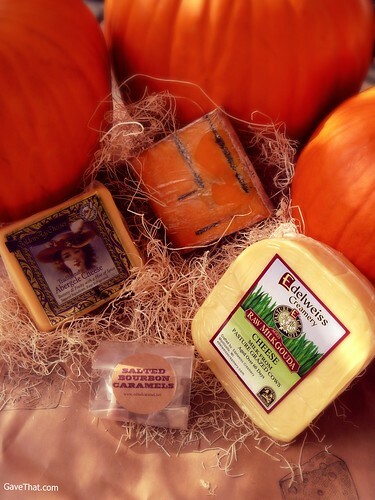 With this subscription service, each month, Yankee Hollow will ship out a selection of their favorite artisan cheese finds. For this month (now sold out, be sure to get on next month's box pronto!) this included all Wisconsin cheese makers and little Salted Bourbon caramels from the Chicago candy store Salted Caramel. A grassfed Gouda from Edleweiss Creamery, traditional Abergele from Specialty Harmony Dairy and, saving the best for last, a blue-chedder called Red Rock by Roelli Cheese Haus... all delivered cool to the office. Along with wine and beer suggestions for each of the cheeses, the little extra caramels were suggested as a pairing to the Red Rock Cheese. Every single one of the cheeses were so good but the Red Rock really stood out with its mild, classic chedder flavored mingling with blue cheese veins and a slight mushroom earthiness (from the red rock cave it's aged in?). Who would have thought salted caramels and chedder blue cheese would taste so good together? Clearly Yankee Hollow knows their cheese. Act fast to get next months box and also look out for their special holiday gift collections debuting soon. October box c/o Yankee Hollow, beyond amazing!